One of the challenges of any garden design is defining the areas of interest, sometimes referred to as ‘zoning’. This is basically specifying what each section of a garden will be used for such as patio, vegetable garden, lawn, play area etc. This applies to every garden whether big or small. The one factor that generally rules most designs is that the garden has physical boundaries, be it a fence, wall or hedge and these boundaries determine the useable space, the size of the lawn, the size of the patio etc. Garden boundaries are a really positive thing when it comes to garden design as you know instantly what you are working with. However, there are always exceptions to the rule and detailed here is a small part of a much larger project A recent project in Lancashire where a house being renovated and extended had a steeply sloping garden to the front which apart from a few low retaining walls had no garden boundaries, it was open to a field of several acres. 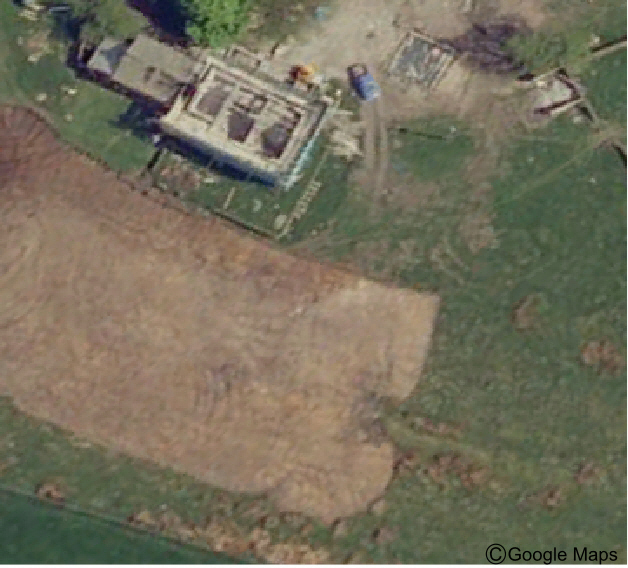 Aerial photograph of the site during landscape works – it is a huge site. Being at the top of a hill the house has the most fantastic views although the exposed site also meant that it was most certainly at the receiving end of all the wind, rain and snow. 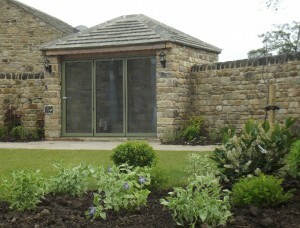 With garden design there are many factors to consider such as practicality, maintenance and usability. The easiest solution for the clients and most practical for this site was to turn the majority over to grass and lawn with a shelter belt of trees and mixed hedging to the east and west. Nearer to the house formal lawns, a garden fitting of a modern country house and a courtyard garden were created. Everything was designed to enhance the property and not distract from the amazing views. The solution was to design a 2m high curved stone wall which linked back to the main house and created both a courtyard area to one aspect as well as a sheltered garden area to another which could be looked onto directly from the main rooms of the house. This is like creating boundaries where none existed so the rest of the garden can be created, but it also enables other features to be incorporated such as a summerhouse, discreet garden lighting and a stone seat among the planting. 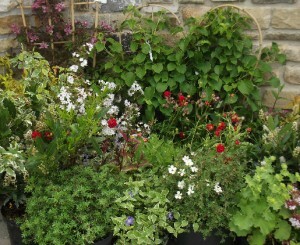 A selection of the plants before planting. As this is a modern take on a walled garden it was decided to have some vibrant planting, this also had to be low or at least easy maintenance and withstand the weather. The plants were sourced from several suppliers and included shrubs and perennials in varying sizes from small plants up to 15 lire container sized specimens. Planted within the garden are some double-white hawthorn trees. As we knew hawthorn grew well in the area and on the boundaries of nearby fields so we could confidently predict that they would also do well in the garden – and they have! The photograph on the right shows some of the chosen plants in their containers. These included climbing Hydrangeas for the walls in the courtyard, Alchemilla Mollis and Vinca major variegata for groundcover. White Potentilla and bright red Geums were chosen for their bright flowers that go on for a long time through the summer and punctute the border well with spots of colour. For structure within the main border shrubs included Budleja and Prunus (laurel) Otto Luyken amongst others. The first summer shortly after planting and everything starts to grow. There was a large amount of quality soil and compost incorporated into the planting areas in the garden. During construction which shows where all the new ‘boundary’ walls are and how they all work together incorporating the summerhouse.